Love these Ray Bans. One of my many great purchases from Overstock! Ray-Ban RB 3025 are a great way to express yourself. Distinguish from the crowd with these Gunmetal Metal Ray-Ban Sunglasses. 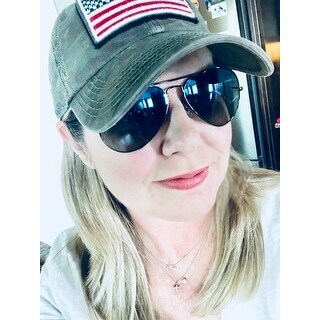 This is my 3rd pair of Ray Ban aviators but 1st with polarized lens. I am never going back. The clarity of the view pays for itself. Love these Ray-Ban's! I was worried they would be too big since most of the reviews were by men, but they fit me great and look awesome too. 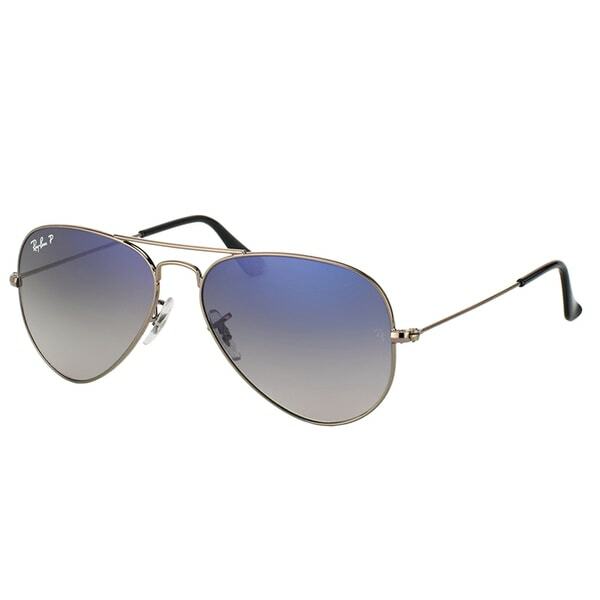 They have a cool blueish tint to them and are just a great classic aviator. Very nice sunglasses. Everything I expected and more, succeeded my expectations on the price point, especially putting the coupon on top of the sale price. Most of all they are authentic. I usually pay the premium to buy them from the manufacturer Ray Ban directly because worried about fakes and copies, which is what is usually for sale on places like Amazon. So I am very happy with this product and the fact that Overstock has the integrity and clarity to sell the original authentic item. I usually stick with the gold frame and green lenses, but love this grey lens and silver frame version! And the same great Ray Ban quality! awesome and authentic ray ban polarized sunglasses. These are the best price on the internet from overstock. These are not too big or too small just right in size and comfort. These sunglasses are exactly what I need. They look great. They're real Ray-Bans. I love them. I got these for my husband who is a pilot, and he is very picky about his sunglasses. He also wants them to be polarized because the sun gets very bright at 10,000 feet. He loves these and says they are very comfortable, they do a good job of helping him see into the distance, and he looks good in them! Also got a great deal on them, much cheaper than a store or sunglasse hut. I have had Ray Ban’s before - a few different pairs. I have always purchased them in department stores. This is the first pair I bought online. Needless-to-day, they fee cheap and I dropped them one time - from about 2 feet off the ground - and the lenses cracked all the way top to bottom. Genuinely wondering if these are actually Ray Bans. They do the job in the sun and look good doing it! Love the quality and are not heavy for being metal frames. These glassses are very nice. They fit good and made good. Would definitely buy them again or another style these are my favorite glasses would definitely buy them again. They look great, but were too small for my husband's face. He doesn't have a huge face for a guy (although not exactly small), so these are probably best for women or men with a relatively narrow face. The glasses themselves are very nice. These have to be some of the best glasses I have ever owned. Ray-Ban did not disappoint. The fir is perfect and the look is timeless. Quick delivery and superior products on Overstock.com. Excellent pair of sunglasses. As nice as the ones you would find at Sunglass Hut. Beautiful color and fit my face perfectly. I couldn’t be happier.